I cannot believe October is already half over! 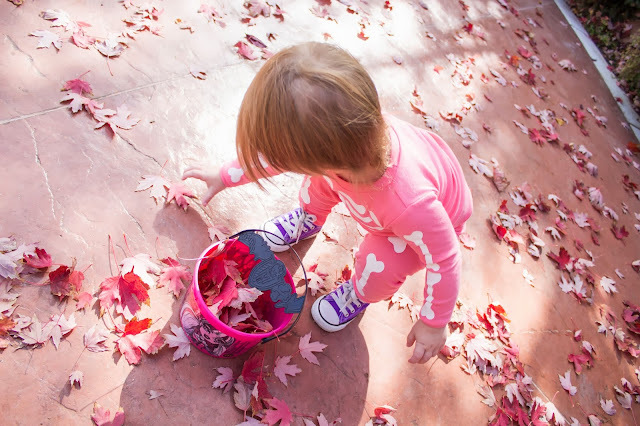 We have had so much fun this month so far and have lots of good stuff planned for the second half, including pumpkin carving, picking out costumes and trick-or-treating and our trip planned to drive back to Arizona (I might will die ... it's TWEEEEELVE hours and Adie doesn't sleep like she used to) and play for a week! We have done so much already! We picked out pumpkins to decorate and keep in Adie's room! 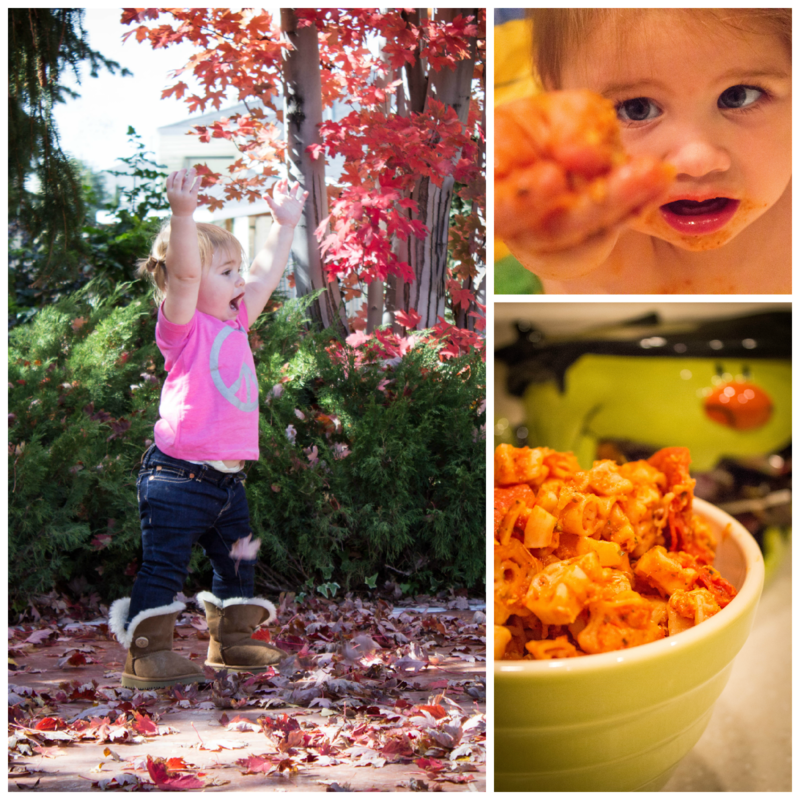 We have been practicing our Peek-A-Boo with Papa and made Halloween Pepperoni Pizza Halloween Pasta which was a big mess but so fun! 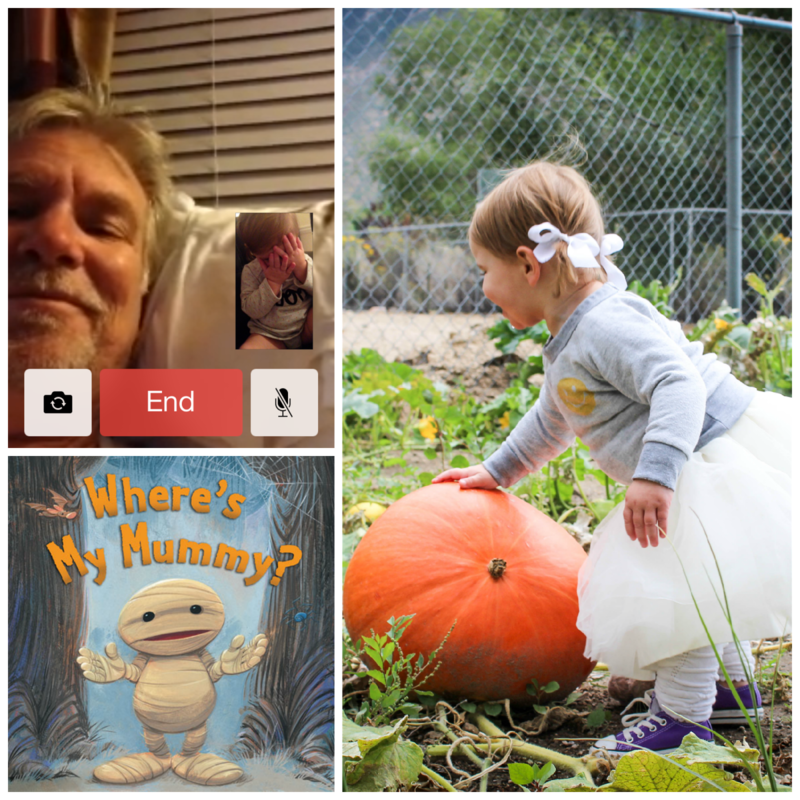 CRUNCHED leaves and can't forget our Halloween reading time! Adie has been practicing her trick-or-treating with her new bucket we got from McDonald's Happy Meal. Her favorite thing to do is to fill it with leaves in the backyard or with anything that's in the house. 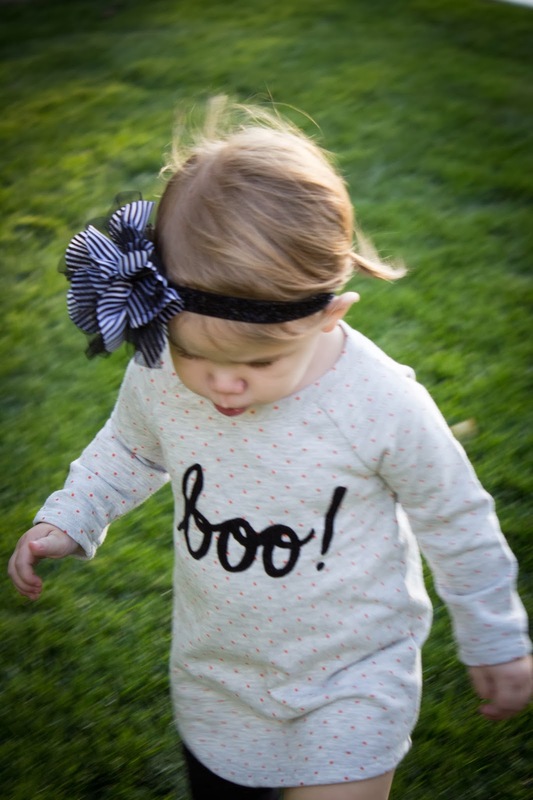 But she seriously loves being outside even when it's sixty degrees with crisp breezes and those crunchy leaves! 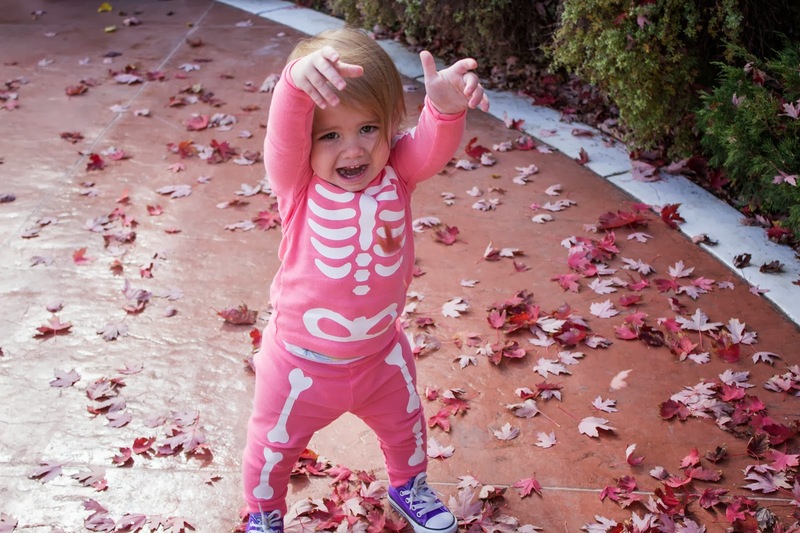 We play in our pajamas because who wants to change out of these stinking cute bones! 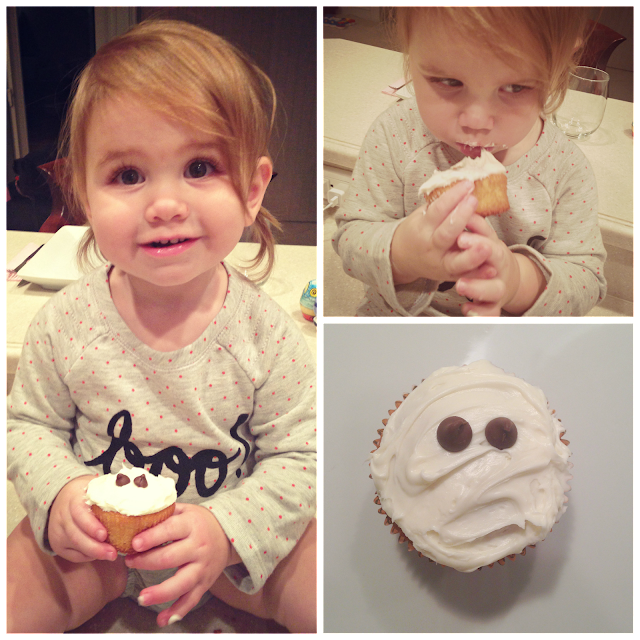 We had so much fun making BOO cupcakes! The best day ever with this cute girl! I would seriously give her cupcakes all day long if I got this cute shot back every time! She was so funny eating the frosting first (so my daughter) and trying to wipe it off her hands! She hasn't figured it out that all you have to do is lick it off! A-DOR-A-BLE! Tried a soup recipe from Pinterest! I am all about soups right now! They go perfectly with the cooler weather and they do the best job of warming you up (and My Guy)! It was delish and even better the second day! You guys have to try it and see! You can find the recipe here and I thought it was pretty simple to make [ I think I might boil the potatoes next time ] until I had to pour some in the blender but I think that's because I am not a cook I only pretend to be! I want to try and make these and these next, I love anything that is Chicken Enchilada like! YUM! Hope you guys have been having an amazing October so far!! I'm not gonna lie, I am kinda super excited for Thanksgiving and Christmas. Not sure if I am more excited for the food, the festivities or the decorations! I can't wait to put Adie's tree up again! EEEK! This really is the most wonderful time of the year!! !